With over 20 years industry experience, Julia Rose is a celebrated floral artist with an international reputation for her sumptuous organic and naturally eclectic designs. Julia Rose is the epitome of artistry and glamour when it comes to her floral arrangements. She has built her reputation on her jaw-dropping design and dedication to perfection, for all who have hired her ; be it the fashion and media industry requesting her to sprinkle her magic on bouquets and floral hair arrangements for their runway extravaganzas and fashion shoots; to the avant-garde media campaigns she has been appointed to for appreciation of her je nais se quoi; and the multitudes of clients who entrusted her to leave lasting impressions with her stylish impeccable eye for floral design, she has been consistently impressive. ‘I am one of those lucky people who just adore what they do! I love inspiring people for the momentous moments & special occasions in their life with exquisite flowers and beautiful styling props. My love of flowers stems from spending hours amongst the blooms and herbs in my grandmother’s garden as a little girl. Playing inside cavernous branches of the magnificent hydrangea, picking one of my Grandfather’s prized roses to carry around with me all day to enjoy it’s sweet perfume…. relocating snails out of the garden and worms into the garden. Now, on my farm, I wake up bright and early to collect the florals for the day as Hook, the larrikin rooster cheekily welcomes the sun and watches protectively over his harem of hens. Rosie, my rowdy pup runs happily through the rows of peonies with a basket to help/hinder me collecting them. Possum the galah and Chachi the parrot always have a chat and nibble of the fresh sunflower seeds scattered on the lawn. Rod, my main squeeze, plays flamenco guitar under the weeping fig while I design a fabulous floral gown for a photo shoot. Life is perfect, I’m living my dream. I love creating & designing beautiful pieces of floral art – from sweet and simple all the way to the spectacular! Working with event coordinators, I help bring a room, marquee or simple area to life with flowers. Flowers relax, be-dazzle, impress and evokes the senses through sweet perfumes. I take the utmost pride in my Designs & my Name. Over the years I have helped to inspire brides by passing on “the seasons’ trends to many publications as well as being a freelance writer for some of Australia’s top Floral Industry Magazines.” Julia is one of the Judges in Australias most popular Floral design competitions within the Industry. Rockstar florists. And the list goes on, see below ……. Curator for the Brisbane Arcade’s Spring Flower Show. Feature demonstrator at the 2017 Spring Flower Festival. Designing all of the media campaign imagery. Media draw card for the gold Coast Gardening expo, Botanical Bazaar. Esteemed Judge in the ‘Tesselaars ROCKSTAR florist Competition. Drawing over 2500 entries throughout Australia & gaining over half a million views on social media throughout the campaign. 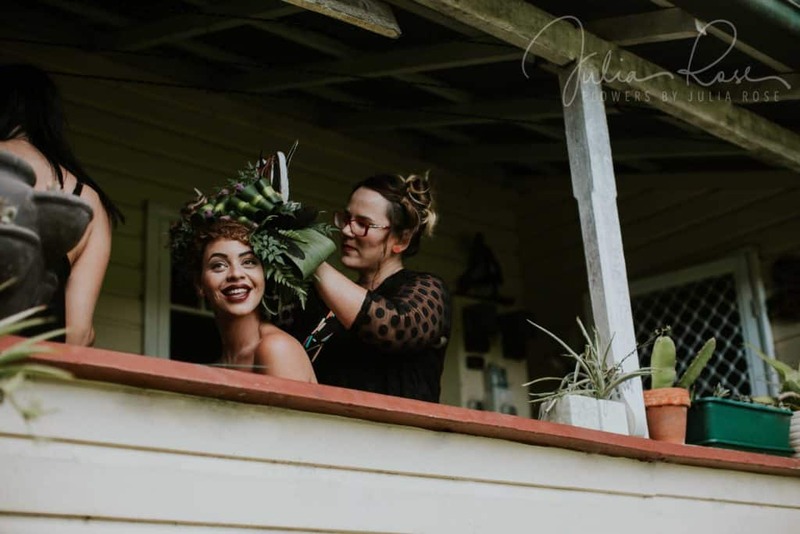 Designs have featured in publications such as The Brides Diary, Gold Coast wedding Magazine, Peppermint, New idea, Qld Brides, Qld Weddings, The Bulletin, The Courier Mail, The Sun, Northern Rivers Bridal diary, Eco Bride, Slim, Label, Envie, Elements, Ruth, Junkee. Countless Cover images. Holds floral demonstrations throughout QLD representing the Floral Association of QLD to Industry professionals (FAQI). Featured on ABC, 9 & 7 news and Fashion TV with fresh floral head pieces. Writer tips and hints on “what’s hot & In trend” in wedding flowers for Queensland wedding magazines. Esteemed floral schools from around the world direct their students to Julia Rose’s website and Facebook for inspiration. Creates designer gowns, archways and media walls for red carpet & media events. Writer for Australia’s most trusted flower supplier Tesselaars & the Floral Association of Australia Magazine. Featured on the world’s top ranking blogs specialising in flowers & fashion trends. Designs have been featured in worldwide campaigns, as well as national and international fashion magazines. Created an avant-garde floral gown for the QT Gold Coast Fashion week and awards. Opened International Fashion Week with three “floral gown” creations in 2014. Opened the Sunshine Coast Fashion Week in 2015. Designs gowns, archways and media walls for many red carpet and media events. 5 years teaching floristry at the Gold Coast Institute of TAFE.